The disaster impact area extended over 200 miles from north to south and includes communities from Pueblo to Fort collins. Thirty-nine major interstate and highway roadway segments, along with numerous local agency roads, were temporarily closed due to the flood event. In an effort to get residents back into their homes and re-establish access to isolated communities as quickly as possible, Gov. Hickenlooper directed CDOT to re-open all impacted interstates and highways by Dec. 1, 2013. This required an enormous undertaking and cooperative effort between CDOT, FEMA, the Federal Highway Administration (FHWA), the National Guard, local agencies, 39 contractors and three major consultant teams. To achieve Gov. Hickenlooper’s directive, CDOT focused on implementing fast-track, temporary repairs to provide sufficient infrastructure to support basic mobility requirements. 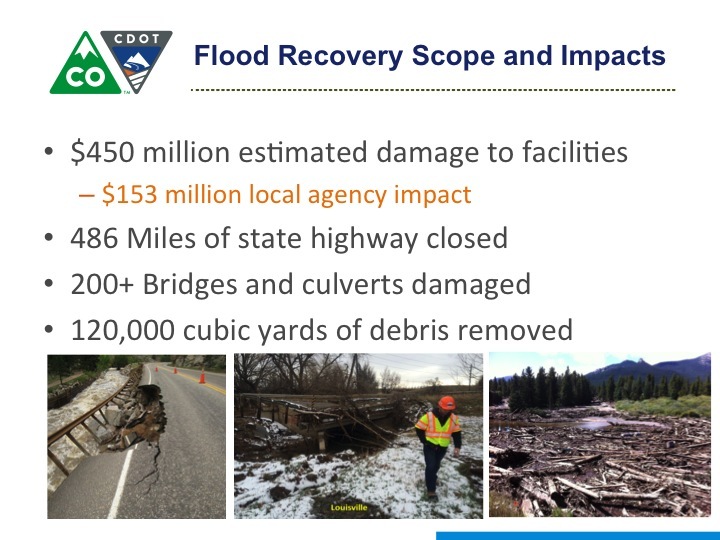 Temporary repairs included debris removal and rock scaling, roadway repairs, construction of bypass roadways, and stabilization of bridge structures. Through this intensive temporary repair effort, all impacted CDOT roadways were re-opened before the Dec. 1st deadline. Additional emergency repairs continued to be made through the spring of 2014. The repairs implemented during the emergency response phase of recovery were short- term fixes to get traffic moving as quickly as possible. However, many of these repairs are not adequate for the long-term needs of the transportation system. Therefore, CDOT has established an aggressive, long-range plan to systematically develop and construct permanent repairs for affected infrastructure. Work under this plan is anticipated to occur over a span of approximately five years and will range from small debris removal projects to major corridor repair and reconstruction projects. These repairs began in Spring 2014 with US 36 from Lyons to Estes Park as the first project to move forward. The plan addresses only those roadways that are owned and maintained by the State. Long-term repairs to local roadways will be implemented by local agencies. Use the CDOT interactive map to view planned projects. Video: Johnny Olson, CDOT Regional Transportation Director gives highway flood repair update to residents at the August 2014 Road to Recovery Expo in Estes Park.